Ukraine is among the countries that possess reserves of all types of fossil fuels: oil, natural gas, condensate, coal, peat, oil shale, but available reserves, their production and use varies in amount, and totally they do not provide the necessary level of the country’s energy security. According to the oil-gas zoning, four oil and gas province are distinguished in Ukraine: Dnipro-Pripyat, Baltic-Fore-Dobrogean, Carpathian, Fore Black Sea – North Caucasus – Mangyshlak. Dnipro-Pripyat oil-gas province includes Dniprovsko-Donetska oil-gas region, which is the main by amount of initial potential hydrocarbon resources. Dniprovsko-Donetska Depression is characterized by irregularity in distribution of different types of hydrocarbon accumulations, both oil and gas fields are occurred in the southwestern part, and mainly gas – in the south-east part. The majority of identified oil and gas fields are concentrated in the Lower Permian and Upper Carboniferous rocks, considerable amount of resources – in the Lower Carboniferous sediments. Prospects for increasing the resource base are associated with Devonian sediments. Baltic-Fore-Dobrogean oil province includes Volyno-Podilska gas-bearing area and Fore-Dobrogean oil and gas area in Ukraine. Carpathian oil and gas province is represented in Ukraine by Fore-Carpathian oil and gas area, gas-oil area of Folded Carpathians and Transcarpathian gas area. In tectonic aspect, the hydrocarbons are confined to the Carpathian and Transcarpathian troughs and folded Carpathians. 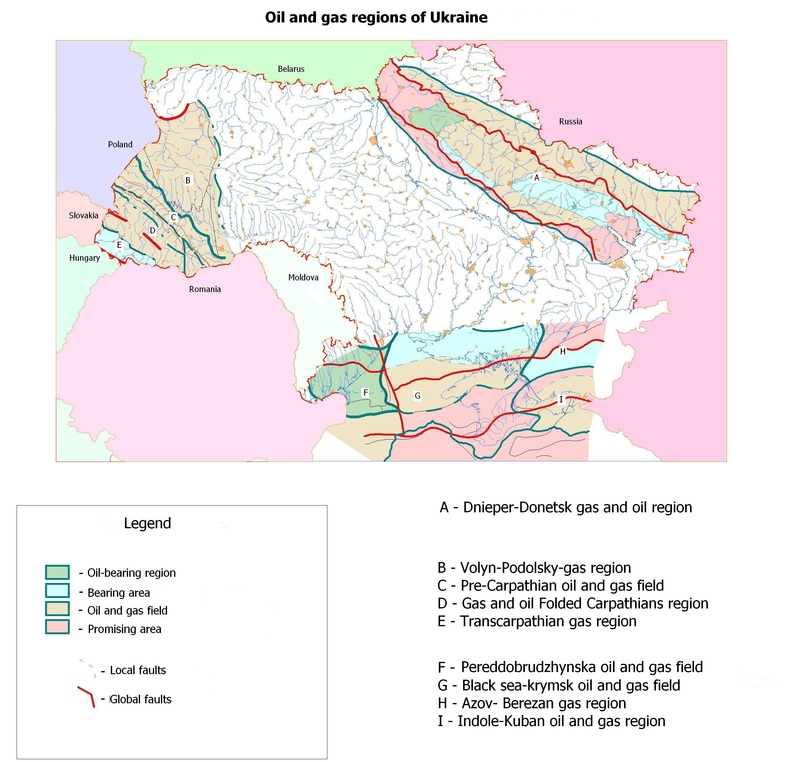 The area of Fore Carpathian Trough comprises the main oil and gas area in the western regions of Ukraine. By tectonic patterns and geological development, two zones are clearly distinguished over there: internal and external. The oil and gas condensate fields are confined to internal zone, and gas fields – to the external one. Producing formation in the internal zone is composed of flysch Cretaceous-Paleogene sediments, and in the external zone – platform Jurassic-Cretaceous and molasses Tortonian-Sarmathian (Messinian) sediments. Black Sea – North-Caucasus – Mangyshlak province within Ukraine includes Fore Black Sea – Crimean and Indolo-Kubanska oil-gas-bearing areas and Azovsko-Berezanska gas-bearing area. 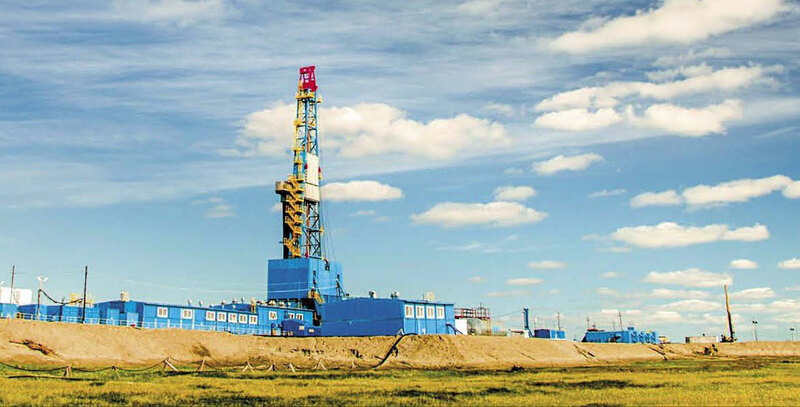 The oil-gas-bearing encompasses full range of rock formations from Paleozoic to Quaternary. The main concentration of hydrocarbons found in Lower Cretaceous, Paleogene, Neogene and partly in Upper Cretaceous sediments. Discovered hydrocarbon fields are associated with Karkinitsky-North Crimean, indolo-Kubanskiy, and Fore-Dobrogean troughts and northern slope of Central-Azov uplift (Azov arch). Gas and gas condensate fields are mainly concentrated in Karkinitsky-North Crimean trough and northern slope of Azov arch, and oil fields – in indolo-Kubanskiy trough. The area of Fore-Dobrogean trought is oil-gas-prospective. Major oil-gas-bearing piles onshore Fore Black Sea – Crimean area include Lower Cretaceous, Maikopska, Silurian-Carboniferous; and offshore – Middle Miocene – Paleocene, Lower-Cretaceous, Palaeocene-Eocene-Maikopska. 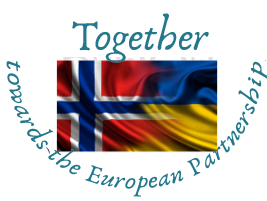 The most promising areas for new hydrocarbon fields discovery in the south of Ukraine are the Black and Azov Seas; and in the east and west – undrilled sediments at great depths in Dniprovsko-Donetska and Carpathian oil and gas areas. Improving the energy potential of Ukraine is connected with the possibility of using gas from coal fields as a fuel. The main component of gas in coal fields is methane, contained in amount of 80-90% or more. Methane, as concomitant commodity, is assessed in the coal seams of Carboniferous age in Donetsk and Lviv-Volyn basins. The group of solid fossil fuels is represented in Ukraine by hard and brown coal, peat, oil and menilite shale. Ukraine has considerable reserves of coal of all genetic coalification stages – from brown to anthracite. 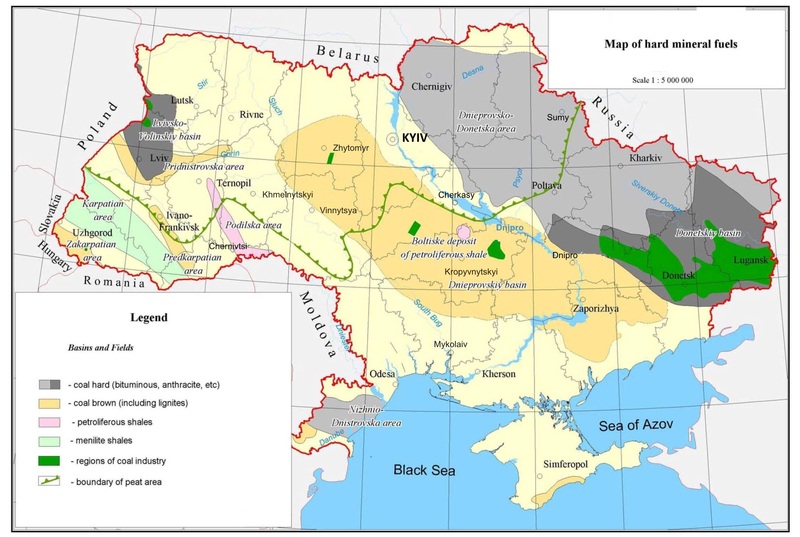 Coal is concentrated in two basins: Donetsk and Lviv-Volyn. Brown coal is developed mainly in Dnipro basin, and much less in Dniprovsko-Donetska Depression, Fore-Carpathian and Transcarpathian coal-bearing areas that include the groups deposits or occurrences. Peat deposits of Ukraine are mainly of lowland type (96% of total resources). The highland (1.8%), transitional (1.6%) and mixed (0.6%) types of peat deposits are also known in small quantities. By the nature of peat deposition and characteristics of peat deposits the following areas peat areas are identified in Ukraine: Poliska, Malopoliska, Forest-Steppe, Steppe, and Carpathians. The most favorable conditions for peat deposition occurred in the post-glacial period in Polissya, where numerous and varied peat bogs were formed. Reserves and resources of peat in this region (Volyn, Rivne, Zhytomyr administrative regions) account for almost half of entire peat fund of Ukraine. The sediments that include deposits and occurrences of oil shale are confined in Ukraine to the different tectonic structures and observed in different regions. In general, there are two geodynamic groups of shale-bearing formations: ancient platforms and geosynclines. The oil shales of Bovtyshske deposit and Rotmystrivskiy occurrence, south of Podillya (Florianivske, Sloboda-Savitske and Novoselytske shale occurrences), and border area of Ukraine and Moldova (Naslavchenskiy occurrence) were formed in the conditions of ancient platform. The Carpathian menilite shales and thin occurrences of Taurian oil shale in Mountain Crimea were formed in geosynclinals conditions. To date combustible and menilite shales of Ukraine are not used as fuel and energy resources.